Invasive plants and animals are a major management issue for many Wet Tropics industries as well as for environmental managers. The problem is likely to be exacerbated by changes in the climate of this region. 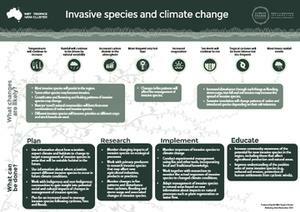 Scientists from James Cook University and CSIRO have worked with NRM groups to carefully consider the likely impacts of climate change for biosecurity in the region, together with potential actions we can make to adapt invasive species management.This information is presented in the fact sheet. Unfortunately, scientists expect that climatic conditions will remain suitable for most of the invasive species that currently occur in the Wet Tropics region to continue thriving. In fact, more frequent and extreme events such as intense cyclones and heavy rainfall will create more opportunities for the spread of pests and weeds by disturbing soil and native tree cover. On top of this, new species are likely to become a problem. This could include species that are already in the Wet Tropics but might be considered nice garden plants such as sleeper weeds, which could flourish with new climatic conditions. It’s also likely that a range of new species will come in from other areas, including from outside Australia. Experts in the field refer to this as the ‘tidal wave’ on the border. In addition to plants and animals, the risk of diseases and pathogens (infectious agents) is expected to increase as climate continues to change. For example, conditions for major disease carriers such as mosquitoes are likely to improve and this could expand to higher altitudes and further south. Because of the large uncertainty and unpredictability around biosecurity management, information from people working on-the-ground will be critical to devising effective management strategies. Useful information about how pests and weeds are responding to changes needs to be collected and shared. Partnerships between researchers, invasive species managers, farmers, fishers and others who regularly observe changes in the environment (including tourism operators) will be crucial. As well as considering the likely impacts of climate change on biosecurity, scientists from James Cook University and CSIRO have considered the potential actions we can take to adapt the way we manage pests and weeds in a changing climate. How can we manage environmental weeds under climate change? Improved conditions for pests and weeds is likely to coincide with more challenging conditions for many native plants and animals. As a result, we may need to revise our current approaches to prioritising and then managing environmental weeds. For example, at the moment we have a reasonable understanding of which plants or animals naturally belong in an area, so defining weeds and prioritising those that are having the biggest impact, is relatively straightforward. However, as plants and animals respond to changes in the climate they may move into areas they haven’t previously occupied, while species that used to occur in the area start to move out or even die out, making it difficult to decide which species do and don’t ‘belong’. The concept of ‘belonging’ has for a long time been based on historical ecosystems. A new concept of ‘belonging’ might be needed and it might be necessary to consider some particular weeds as ‘belonging’ in the future. Furthermore, it is likely to become more complicated to decide which invasive species are having the most negative impacts on environmental values, because systems will be changing so rapidly and in unprecedented ways. We may not have the understanding of the characteristics of new pests and weeds or understand how “familiar” ones may change their behaviour due to the changed conditions. How can we manage weeds in production landscapes under climate change? A changing climate will also affect weed management in primary industries in the Wet Tropics. Firstly, different invasive species may benefit from changing conditions, meaning that plants and animals that are not currently a problem may start to cause problems for farmers. Secondly, some of our current crops and livestock will be unsuited to new climatic conditions. The shift to new crops and livestock will also involve management of different pest and weed problems. There is considerable discussion among researchers and managers about how to handle these complications. A project known as Adapt NRM has developed information about planning and managing for invasive species under climate change in Australia. This includes information about new approaches to prioritising management of invasive species. There is a full adaptation pathways report available from the work undertaken by James Cook University and CSIRO scientists. Recent CSIRO and Bureau Of Meteorology work has resulted in an exciting new website (www.climatechangeinaustralia.gov.au), which has both detailed information about climate change and interactive tools available to the public.